Payson came into this world screaming and for 6 months she didn’t stop screaming. The nurses at the hospital commented that she was one of the loudest criers they had ever heard, and that she seemed to cry an awful lot. And so we went home with our sad, crying baby. And the screaming continued. 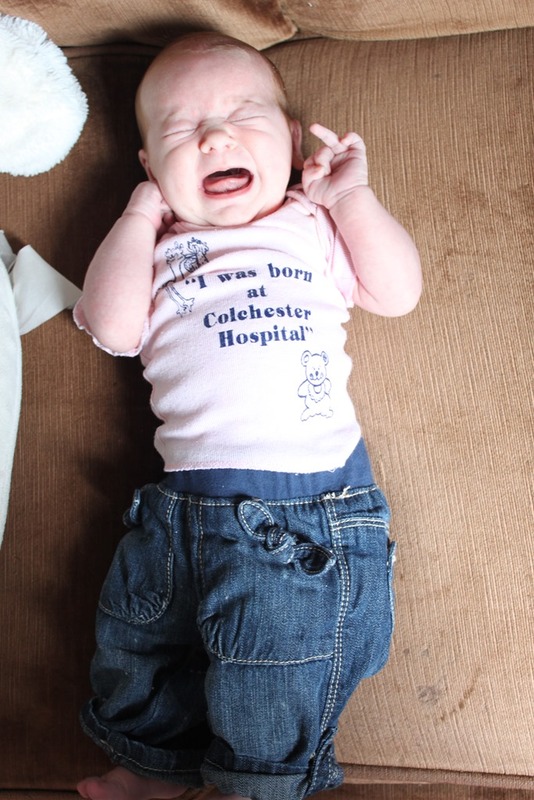 People asked us if she had colic, which in the end does not matter because there is no cure for screaming without reason. Someone pointed us in the direction of the PURPLE crying website and told us to take a look around. 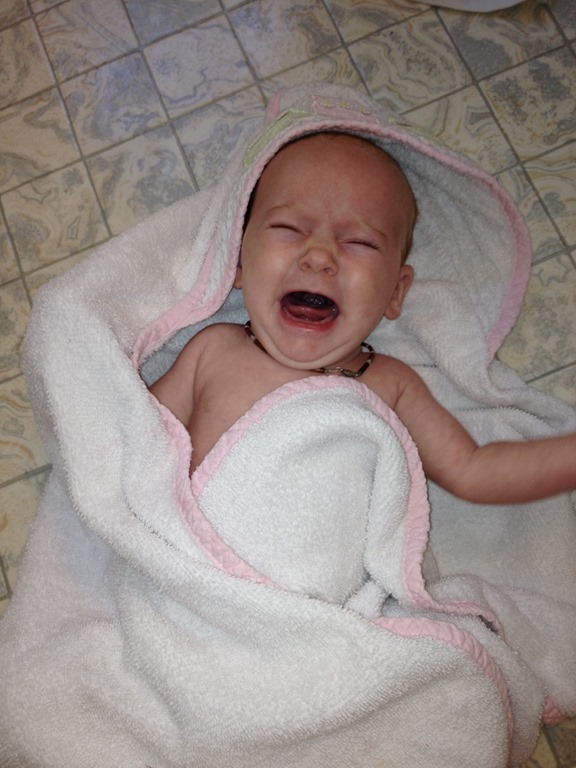 The word colic is not used very often now, instead the idea of the Period of Purple Crying is. 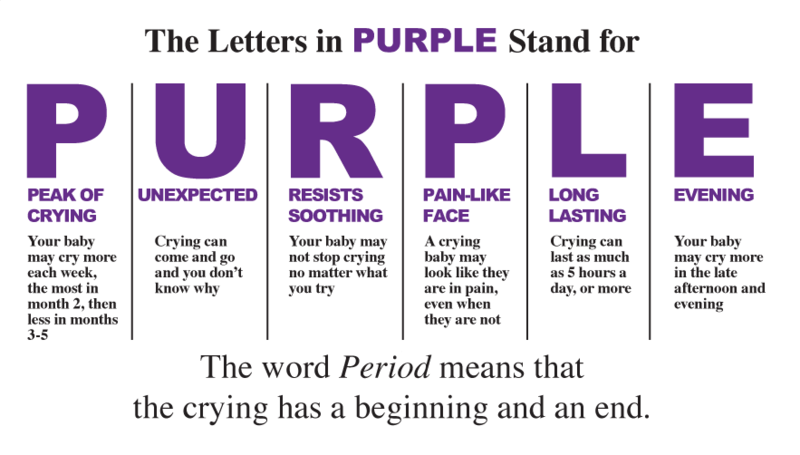 The above graphic tells you what PURPLE stands for and gives you an idea of what to expect. Payson took PURPLE crying to a whole new level. She started at birth and didn’t stop until she was 6 months old when she became a whole new child. We tried so many things to help her. I changed my diet since I was breastfeeding her, and she was put on medication for acid reflux. But nothing seemed to stop the crying. I want to get real with you for a minute and some of you will put on your judgement pants and say nasty things about us, but I think there needs to be blog posts about real things like this because I know for a fact we are not the only family that has gone through this. Remember the last time you read an article or saw a story on the news about a baby being injured or dying because their parents shook them? Remember the nasty thoughts you had about that parent and all the horrible things that you said? I use to have those thoughts, and could not understand how a parent could take a child they loved so much and shake them. And then Payson was born. You see when your child screams for no reason for hours on end you lose your sanity. You lose a part of your brain that makes rational choices. No, we never shook Payson, but there were times when I was holding her while she screamed and screamed at me that I wanted to. Not to hurt her, but there is that part in your brain that makes you think that if you can snap them out of it somehow that they will stop. It is like when a person is manic and someone slaps them in the face in the movies to make them stop. Yeah it is kind of like that. We are not a “cry it out” type of family. We believe that a baby cries for a reason and should be heard, because that is their only way to communicate. But when you have a child that screams almost every waking moment and you have no idea why sometimes you have to put them down. For their safety and your own sanity. When Payson was 2 months old we went to our church campground and I let complete strangers hold Payson and walk with her just so I could have a break. It is times like these that we really do need a village to help raise our kids. It is times like these that I realize how we desperately need more community so that we can help one another. That 10 days that we were at our campground I was able to let others help me. People who had not listened to her scream for days on end so they had more brain cells left in their head to be rational. If this is something you are going through, or if you plan to have kids please remember this post, and pass it on to new parents in your life. Remember that it is okay to ask for help, and it is okay to put your screaming baby down in a safe place for a few minutes in order for you drink a cup of coffee and regain a small piece of your mind. It is okay because in the end it will save your baby and save you. Many hospitals are now making people watch a DVD before they leave the hospital explaining all of this. The hospital that Lyra was born at gives all the babies a purple hat to help parents remember. But you most likely won’t remember the DVD that you watched because the first few days of a new baby are a blur, so we need to get better at educating people and helping each other. A few things that helped us, were co-sleeping (if Payson was nursing she was not screaming), and allowing each other go out for a break (but always with a cell phone in case the parent at home got overwhelmed, these trips lasted up to 30 minutes tops). And the phrase, “it is just a phase, it will get better”.